Post Crete - Blamphayne Sawmills Ltd.
A ready to use blend of selected sand, cement and additives formulated for fixing wooden, concrete and metal posts. 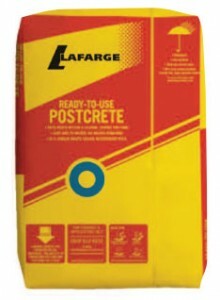 Post crete is ready to use, no mixing required, just add water. Available in 20kg weatherproof bags. © Copyright 2012, Blamphayne Sawmills Ltd.